Good Morning!!!! It's Sara here from Design a Party by Sara! It's my day to share a project with you. 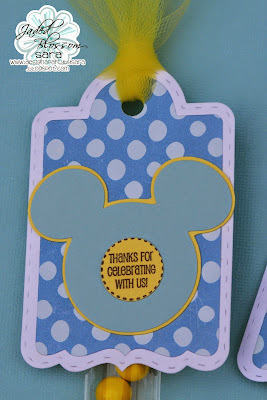 I have a super simple and cute baby shower favor to share with you today. I am going to be a Great Aunt in about a month and we had a baby shower to help welcome my new nephew. 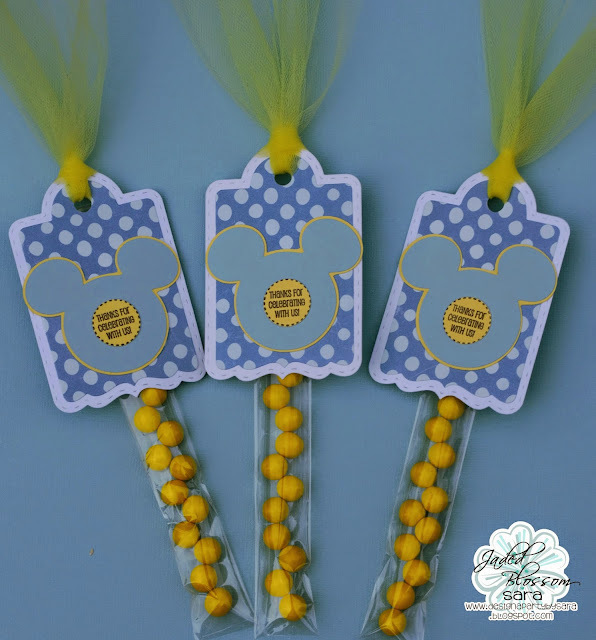 I made a few party decorations to go along with the shower theme, which was Mickey Mouse. The mama to be wanted bright summer colors so she chose to do blue and yellow. For the Mickey head I used my Cricut machine and the Mickey cartridge. The yellow candies are Sixlets candies and I finished the tops off with yellow tulle. I hope you enjoyed my favors today, they were so easy and fun to make and everyone at the shower loved them. Thanks for checking out my project today. Make sure you shop the store HERE. Post your Jaded Blossom creations in the Facebook group HERE and follow the Jaded Blossom Blog HERE . Super cute favors. You did an incredible job. Super duper cute!! Love the treat die! !